Think back to a time you did a favor for someone, not expecting anything in return, and you received thanks after that favor. How did that make you feel? 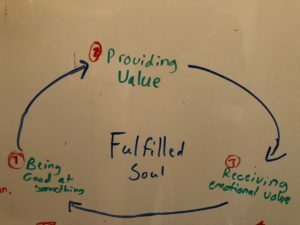 The point of this post is to explain my belief that, fundamentally, at the core of our human nature, we crave providing and receiving value for an action that make someone else’s life better than before. This is in the heart of everyone everywhere, realized or not. Whenever I walk through a heavy door, I like to open it for the people behind me because when someone does it for me, it makes me feel good and I want to return the favor. The door I walk through every morning, to get to my desk, is one of these heavy doors. So when someone else is in need of me holding the door open for them, I do. This makes me feel like I provided value in a way that only I could have done, at that time, and received thanks for that action. It makes me feel weirdly warm inside. Words. Cheap for one person because it’s quite easy to say thank you, but valued highly to the other because that one person went out of their way to say, “thank you”. The transaction of appreciation on both fronts were achieved and therefore a mutually beneficial interaction was generated. This post is also about my idea of what the soul’s energy recycling system, from the roots of our homosapien nature, looks like. Sebastian Junger, American journalist, author and filmmaker, suggests that Indian tribes, when the first colonies were created in the Americas, achieved preferable living conditions in many cases for incoming settlers. ”It must not be denied that there were even some grown persons who shewed and unwillingness to return”, William Smith admitted about some white captives. “The Shewanese were obliged to bind several of their prisoners… and some women, who had been delivered up, afterward found means to escape and run back to the indian towns.” This provides huge indicators that the Natives had figured out how to create some type preferable living environment. Some type of living system that was so preferable that even after the Native Americans released their prisoners back to the colonies of settlers from Europe, the ex-prisoners made efforts to “escape” back to the Native tribes. There are no cases of indians wanting to be apart of the European colonies. This makes me believe that the Aboregenese society has, over the course of thousands of years, created a society that is in itself more favorable when comparing European culture and Native American Culture. Next, It’s important to point out the way that Native Americans were living at the time. The essence of their culture was to provide for the tribe what you could, and no one was barking orders at you to continue working or what have you. So essentially, whatever you provided the tribe with, the more you were appreciated, and the more you wanted to execute on that action again because of the positive emotional yield from the group. For instance, a hunter of the tribe would set out on a hunt, come back empty handed or not, but the fact that he/she was trying to provide for the tribe is what matters. So that one day he does come back with hands full, he is able to provide the tribe with the product of his hard work, food. He worked all those days before, but now his efforts have been genuinely appreciated by everyone in the group, so all the days he came back empty handed seem distant and of no importance and he focuses on what is happening now. He receives appreciation for this because the tribe was hungry, then when the food is cooked, he gets to realize everyone’s appreciation. Their faces show signs of satisfaction and love for him because of him spending time finding, killing, and carrying that animal back to the group. This man has become fulfilled. The full circle has been achieved in his existence. He would be ok with doing the same thing tomorrow because He has realized the tribes appreciation for his efforts. So here is the breakdown of each piece of the circle and how the contribute to the well-being of the mind. Believing you CAN creates a positively reinforcing belief system that you can accomplish this action over and over again, successfully. Lastly, realized meaning or purpose are sufficiently capable of driving someone to the extent of their physical selves to achieve something more than themselves. Viktor Frankl, a Jewish Psychiatrist imprisoned at different concentration camps throughout WW2 including Auschwitz, found a theory called Logotherapy. Through his observations from the concentration camps, the epitome of a hellish state one cannot control, he finds this theory based upon the fact that Man’s reason to live is purpose. Viktor Frankl is regarded as a pioneer in the mental health field by Psychologists like Jordan Peterson that renown Viktor’s work again and again. Viktor talks about the difference between people that live with purpose vs. people that live with wants. What he explains is that the people that were talking about getting that next pasta meal ,with homemade marinara sauce on top of a freshly cooked sour dough bread, those people never made it. The people that talked about finding their families and giving them just one hug, that was enough to keep them going, day after day. This idea would drive the prisoners to continue to wake up at the break of dawn and continue their labor becuase they had the idea in their mind of just one more hug. Viktor’s work is core to my belief that people providing value in someone’s life, other than their own, gives life meaning.